ICYMI: Just before the holidays, NC Department of Health and Human Services announced a major Medicaid rate increase for Evaluation and Management (E&M) codes for primary care beginning in early 2019. Primary care physicians and other primary care providers as defined under the Affordable Care Act (family physicians, pediatricians, some general internists, and Ob/Gyns), will see their rates increase to Medicare or near Medicare rates. 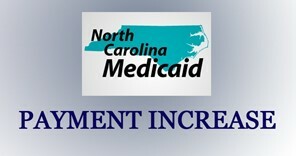 Current Medicaid rates in North Carolina for most E&M codes are around 75 percent of Medicare. The NCAFP and the NC Pediatric Society have worked closely together over the last year advocating for a rate increase for primary care as the program transitions to managed care. Due to ongoing efforts to improve quality and control costs at all levels (including efforts by primary care physicians, the CCNC care management infrastructure and strong fiscal management at DHHS), as well as favorable economic conditions, the Department had enough funding to implement the increases now. Increasing Medicaid rates for our members has been an ongoing advocacy priority for the NCAFP. This announcement is a key advocacy victory for the NCAFP, and we would like to thank NC DHHS leaders and many others in the Department for their work. Members should be on the lookout for additional specifics on the rates of all affected E&M codes in NCAFP’s member magazine due out this February and/or through NCAFPNotes. Because of the process for final federal approval and the reprogramming that will be needed, the rates will likely not increase until around May of this year. However, the increase will be retroactive to January 1, so practices will receive additional revenue for those claims paid prior to final reprogramming.